Being a fan Game of Thrones (GoT) these lines “Night gathers, and now my watch begins.” from the Night’s Watch oath fascinated me. There isn’t “The Wall” to guard from “White Walkers” *damn reality*, so you can’t really take any such oath and therefore cannot recite these lines. But as we all have seen in GoT, Life is full of uncertainty, be it death or happiness. We just need to deal with whatever comes our way. It was just a normal lazy Sunday with a plan to take party & give a tour to one of my friend to Global Vipassana Pagoda. A peaceful place to go away from the city chaos, take pictures of the beautiful pagoda and see some amazing art gallery on the Life of Gautama Buddha. I was roaming around reading the proverbs and taking pictures of the magnificent pagoda when I got WhatsApp message from my beloved uncle, mentor and friend. 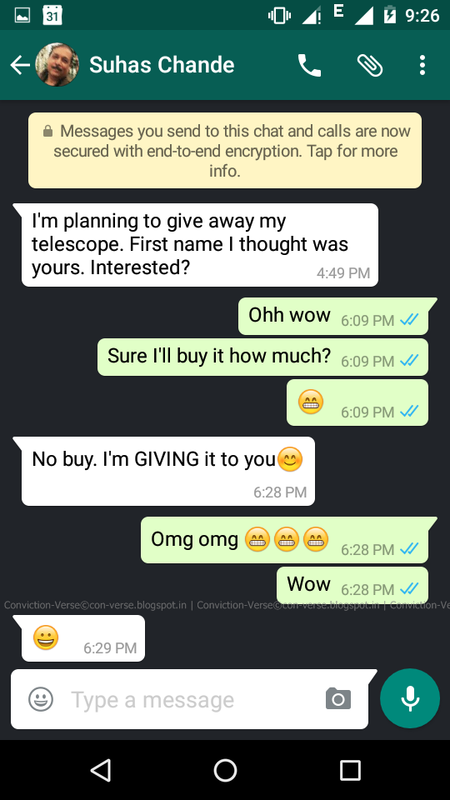 I was going to get “The Telescope”, the same one using which I saw Saturn and its multi-colored rings & Jupiter with its four moons in my childhood. Since that day I started researching on How to use a telescope, its types & concepts, stargazing articles so on and so forth. Gathering as much as knowledge possible. My telescope is a refractor telescope. Its weight, its fragile nature. How to carry it while you are walking. 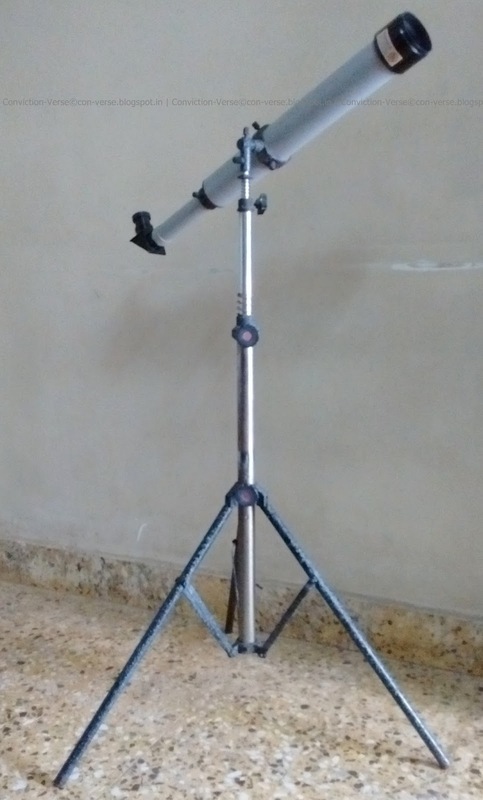 Practised to assemble and dismantle it till I got comfortable with its handling, its various screws & their functions, understanding the extent of both the telescope & the tripod. Practised in the day light watching faraway landscapes like trees, Electricity poles on mountain top etc. With this I learned how to find & focus on a distant object. The use of various ocular lens. I kept practising this for many days till I got the hang of it. WARNING: Do not use the telescope to watch the Sun. It will result in eye damage or permanent blindness. The one rule which I followed in the above steps is to “OBSERVE & NOTE”. 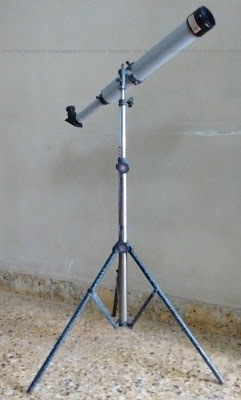 Be it carrying the telescope and tripod, assembling or dismantling it or using it to view objects. Your observation and taking notes (either mentally or by using a book) will make your future sessions with your telescope more easy, enjoyable and quick. Keep researching on internet regarding your telescope and stargazing to update your knowledge and upcoming events. Join an astronomy group as there you’ll find people with similar interest and thus more knowledge by sharing it. “Astronomy teaches patience and humility — and you had better be prepared to learn them. Not everything will work the first time. You'll hunt for some wonder in the depths and miss it, and hunt again, and miss it again. This is normal. But eventually, with increasing knowledge, you will succeed. There's nothing you can do about the clouds that move in to block your view, the extreme distance and faintness of the objects of your desire, or the special event that you missed because you got all set up one minute late. The universe will not bend to your wishes; you must take it on its own terms. Most objects that are within the reach of any telescope, no matter what its size, are barely within its reach. So most of the time you'll be hunting for things that appear very dim or very small, or both. You need the attitude that they will not come to you; you must go to them. 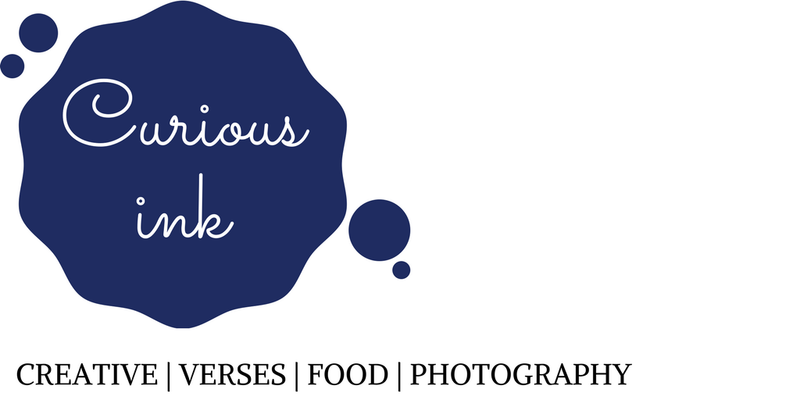 If flashy visuals are what you're after, go watch TV. Part of losing your ego is not getting upset at your telescope because it's less than perfect. Perfection doesn't exist, no matter what you paid. If you find yourself getting wound up over Pluto's invisibility or the aberrations of your eyepiece, take a deep breath and remember why you're doing this. Amateur astronomy should be calming and fun. With the rejuvenated spirit I looked around the sky trying to spot another planet as mars was behind the covers. 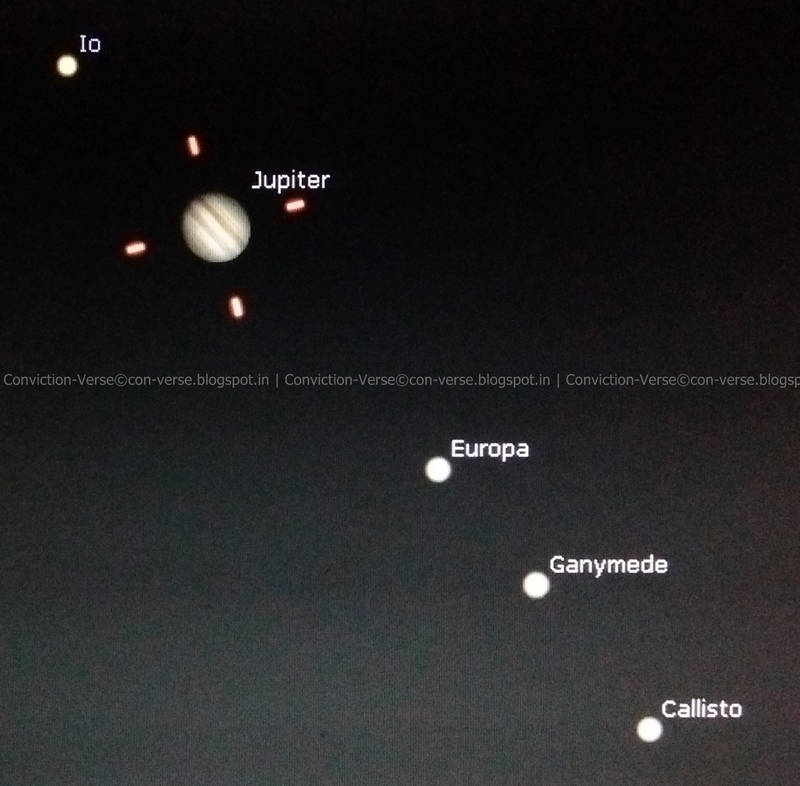 There I spotted Jupiter and using Sky Map Andriod App I confirmed it and adjusted my telescope to watch it. Jupiter was also viewable like a small bright white dot but I noticed something else as well. I noticed 4 tiny twinkling stars in perfect line around Jupiter. I was stunned at the sight and the realisation of what I was actually looking at. Those tiny twinkling stars were actually the 4 moons of Jupiter! I was overwhelmed with the sight which I saw after a decade. This was the formation of Jupiter along with its four moons (Io, Europa, Ganymede and Callisto) which I saw through my telescope. From what I’ve learned from my mentor, I write this article with the attitude to share knowledge and spread enthusiam of stargazing. Lastly, I would say these lines are apt for stargazing: Night gathers, and now my watch begins. For this night and all the nights to come. awesome man :) nice article !!! Thanks :) Glad you liked it. Awesome.. let's go star gazing ek baar, night camping. What say?